Poland is seeking a permanent American military base on its soil at the expense of cooperation with European allies, according to Paul Taylor, Senior Fellow at Friends of Europe and author of the new Friends of Europe report ‘”Fort Trump” or Bust? Poland and the future of European defence’ that emphasised the risks of such a strategy. 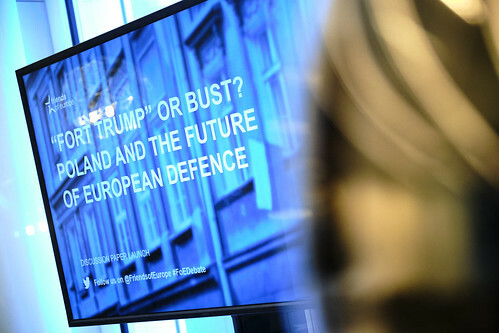 However, Polish speakers at the report’s launch said their country’s geographical exposure to Russia and history of abandonment by European allies made it uniquely vulnerable. Hence, it has needed to place special importance on its relations with the US. The shift comes at a time when Poland is more prosperous, stable and safe than ever before. Its memberships of NATO and the European Union have helped maintain peace with neighbours and generate high rates of economic growth, investment and employment. Yet Jarosław Kaczyński, the leader of Poland’s ruling Law and Justice Party, is haunted by feelings of national insecurity and historical grievance, said Taylor. These have led Kaczyński to pursue bilateral defence ties with the US rather than strengthening collective activities with European partners and NATO allies. “Poland has embarked on quite a sharp change of direction in its national security policies,” said Taylor, noting that the pivot to Washington coincided with a deterioration of Warsaw’s relations with the EU over the rule of law, and with the main west European powers, Germany and France. “Poland is pursuing a risky strategy and setting itself up for disappointment. There may be short term political benefits before it sinks in that ‘Fort Trump’ is not going to happen.” President Donald Trump was not pulling US forces back from Syria and Afghanistan in order to park them in a base in eastern Poland waiting for the Russians to come, he said. Washington’s main security concern was China, not Europe.